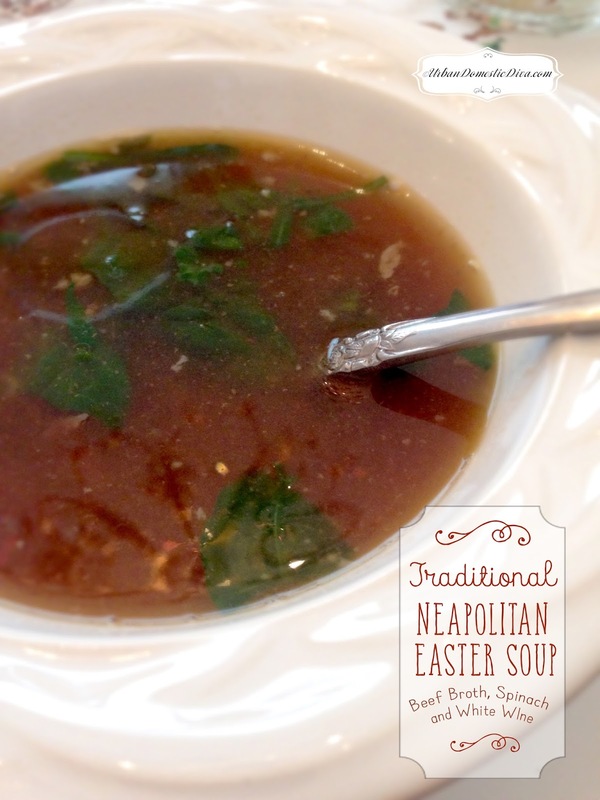 This soup I have made in years past as a great make-ahead first course for a formal Easter dinner. 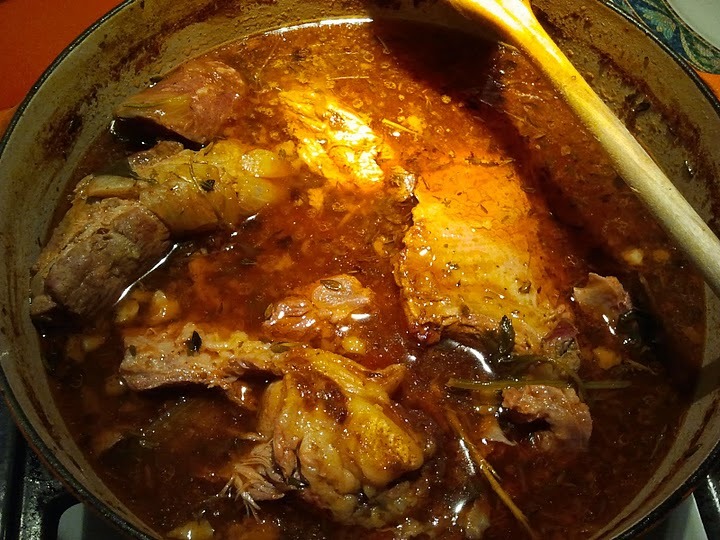 This recipe was derived from a very traditional recipe from the 18th century, and comes from Naples, Italy. I found it here, and make it yearly in honor of my mother who was born there. 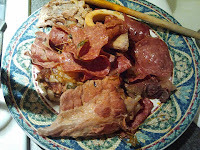 But some things needed to be changed, primarily the meat. Vintage Italian recipes often call for hard-to-find, peasant cuts. They are also out of the mainstream palate. SO I use easier to find cuts. 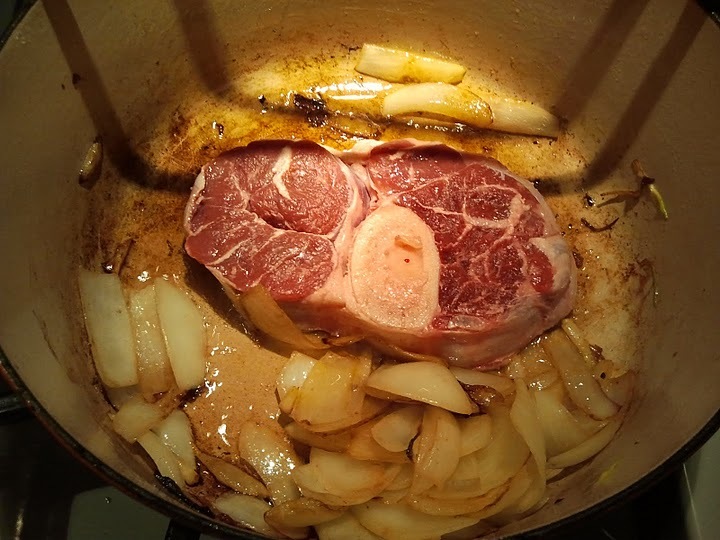 I also brown the meat to get a good base going. And I suggest you use milder, springtime greens and less of them to keep the soup lighter. I am not sure about you, but the Italians have a ton of courses. You don't want the soup to be too heavy and filling before you get to the main course! 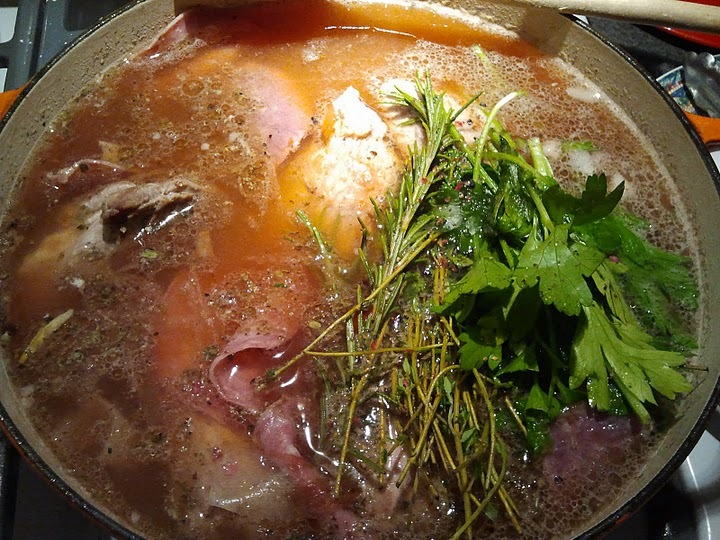 You can make the stock the night before Easter if you wish. I made mine a whole week before. I suggest doing the stock at least the night before because of one simple thing...it is easier to defat it. The meats used here are pretty greasy. The fats solidify on top as it cools in the fridge and you can scrape it off the next day and discard it, leaving just delicious broth. 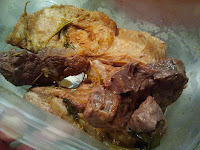 Once you shred the reserved meat and put it back in the "defatted" stock, you can either freeze it as is at that point, to be defrosted and finished at Easter-or you can just continue on with the recipe, serving it that day. Either way, its a savory start to a special meal! Buona Pasqua! In a large dutch oven or soup pot, heat oil on medium high. 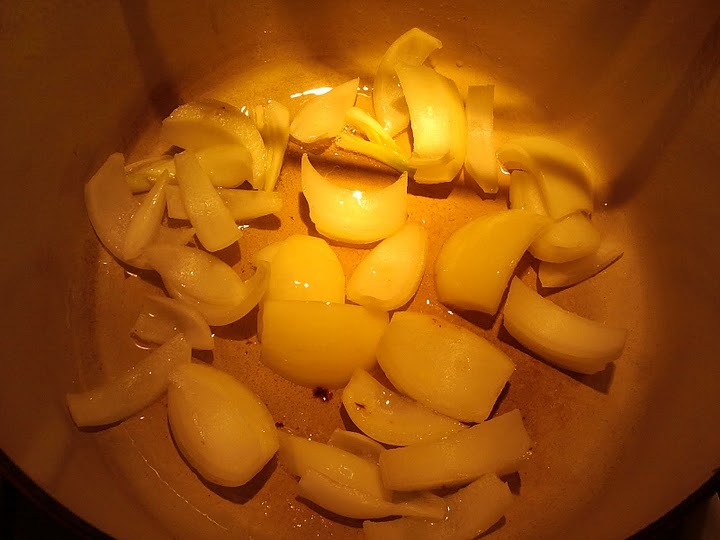 Cook onion chunks until tender. And the Veal breast and brown on both sides. 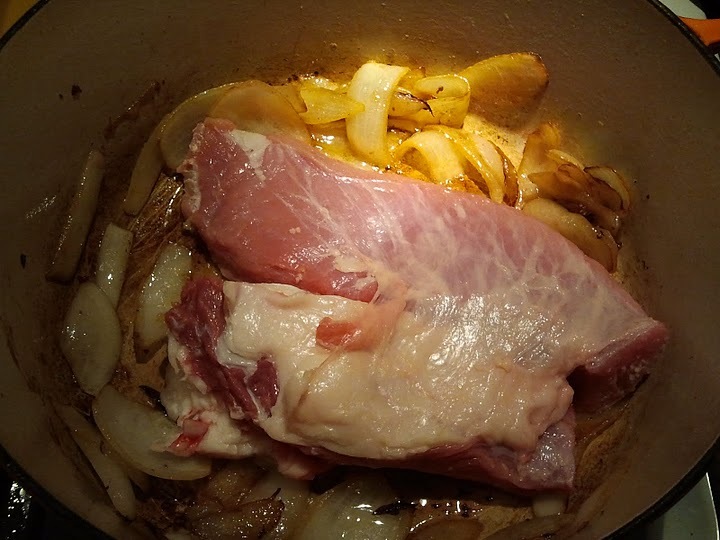 Transfer to a plate, brown the pork ribs (or beef ribs) on all sides. Transfer to the same plate. 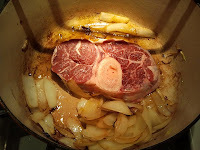 Brown the beef shank, transfer to a plate. At this point, you will have a lot of browning and caramelizing happening on the bottom of the pan. Take a cup of your water and splash it in, scraping the bottom with a wooden spoon as you go. Add all the meat back in. Add the sausage and salami. Pour the rest of the water over all until it completely covers all the meat. Now add all the herbs and tomato paste, and stir gently. Do not worry that it isn't chopped or anything. You will be straining everything out. 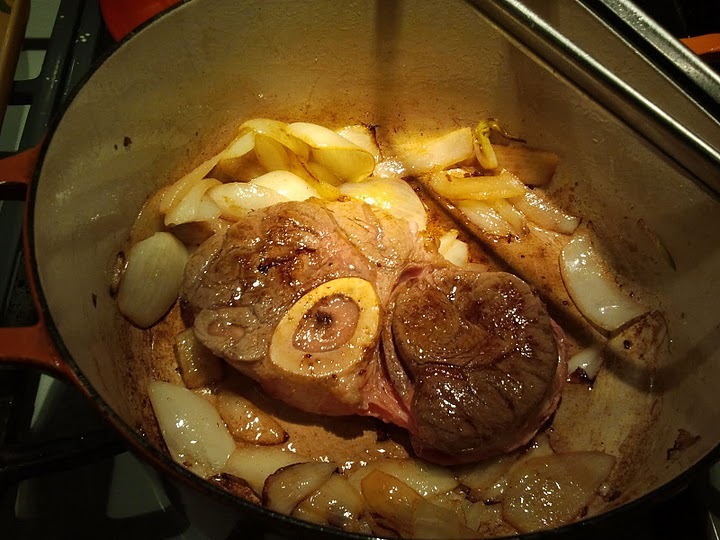 (This is real peasant cooking!) Cook on high until a rolling boil happens, then lower heat to a very low simmer, and cover the pot partially. 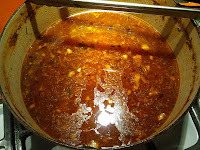 Let simmer for 2 1/2 hours, stirring occasionally. Check and add water if its boiling off too much. 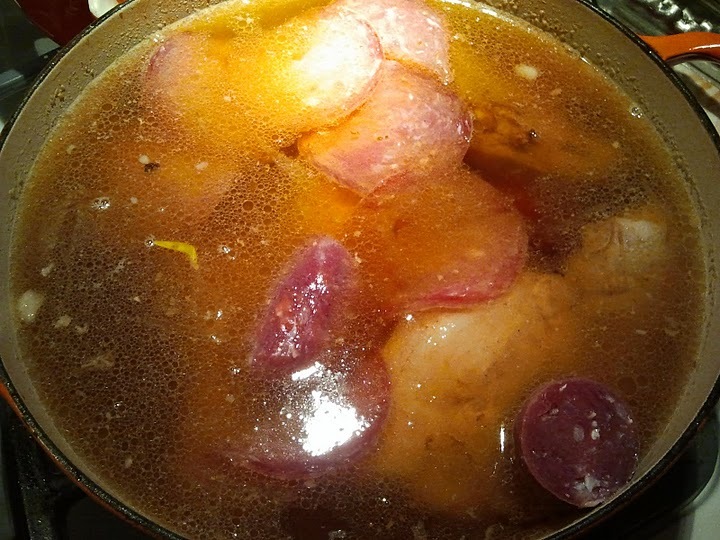 The meat should stay covered in the water. When done, pull out the meat. 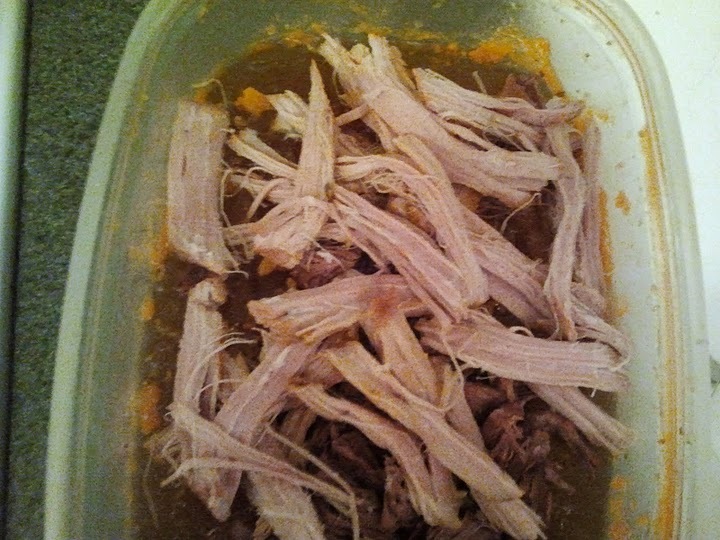 Depending on your tastes, decide what you want to shred and put back in the soup, and what you want to discard. 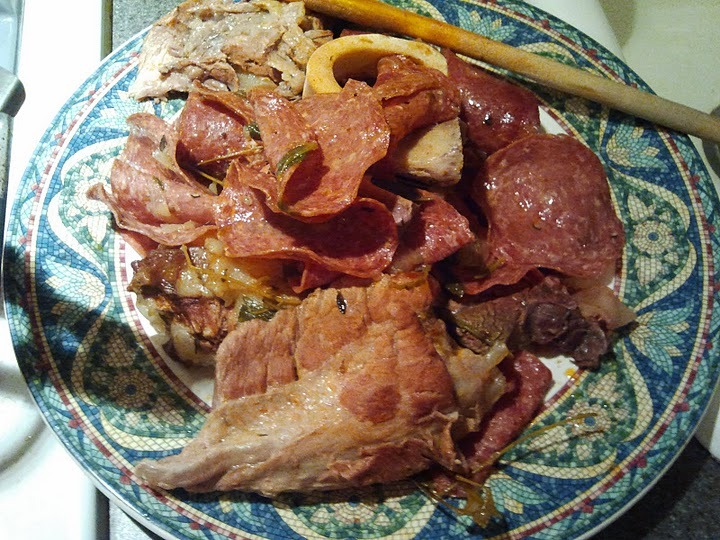 I shred some of the veal breast and the beef shank, and toss everything else. I just take the meat I am going to shred and store it in a separate container until the next day. With the rest of the broth, strain through a fine mesh sieve into a large storage container. Discard all the rest of the remnants of the broth. Store the broth and the reserved meat you plan on shredding in the fridge overnight in their separate containers. 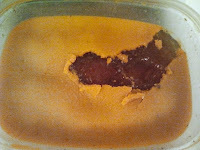 The next day, with a spoon, carefully scrape off the fat solids on top of the broth and discard it. 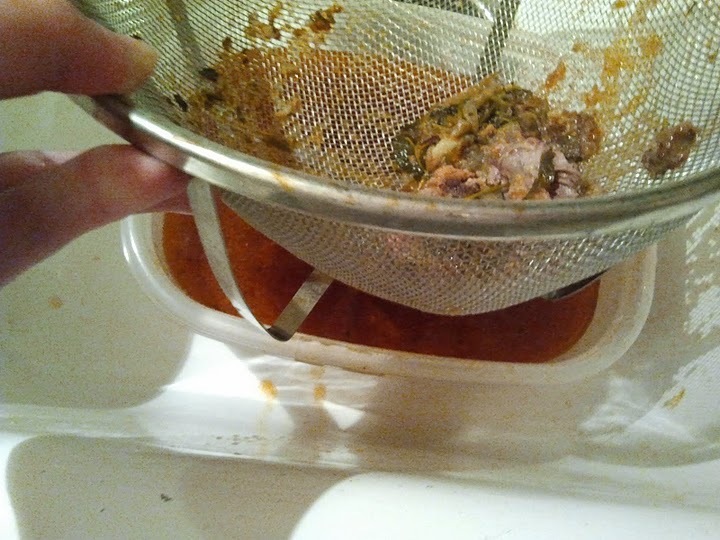 With your reserved meat, tear and shred off about a cup and a half's worth or so, and stir it back into the cold broth. At this point, you can cover all of this and freeze it for up to 3 months. NEXT/OR, pour the cold (or defrosted) broth with the shredded beef in a large soup pot. 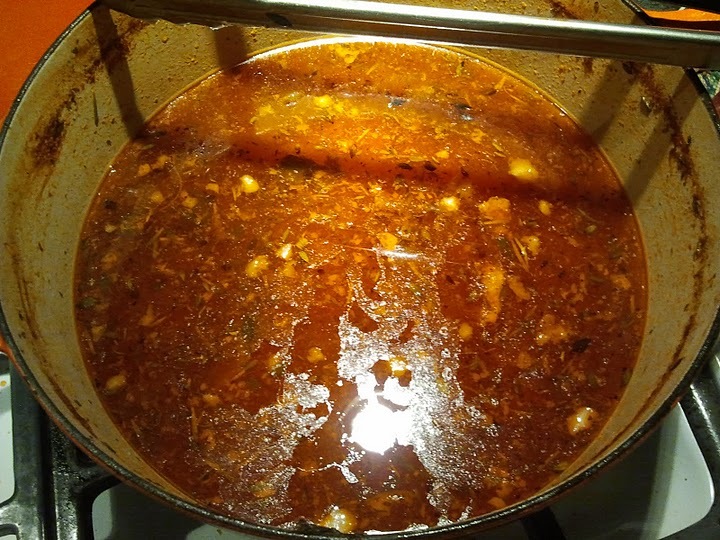 Over medium heat, get the soup to a nice simmer. Add the white wine. Add the spinach and cook until tender. Season to taste with salt and pepper. If the broth is too punchy, add a little water as the spinach simmers. If it is too weak or you need a little more liquid, add some beef broth to kick it up and extend it. (You should have about 6-8 cups of soup, roughly) Serve warm with a little bit of grated Parmesan. (final picture BELOW! ) Got rave reviews!